Through my assessment of small groups as well as my experience leading groups and coaching other leaders, I’ve observed a direct correlation between leaders who hog leadership and groups that do not grow or multiply. Start by developing a recruiting strategy. Make a list of who you think are the right people. Use the normal list of qualifications: knowledge, abilities, charisma, and especially physical appearance. Then consider how you will twist arms to get the ones you want to take on this job. A Better Idea … Ask the Lord of the Harvest to send these “workers.” Yes, start with prayer. Trust him to help you know whom to ask. Announce you are looking for some co-leaders. Ask the group who wants to join you in leading the group. Or send around a sign-up sheet. Let the group decide. Better yet, ask everyone to make a case for why he or she should be a core team member (after all, this is an exclusive club!) and then have everyone in the group close their eyes and on the count of three, point to the people they think should be on the core team. The ones with the most votes win! A Better Idea … Wait and watch whom God leads you to. I wouldn’t even tell group members you are looking for “co-leaders.” Once you have begun praying, watch for whom God puts in front of you. Listen to his voice as you talk to people. Be sensitive to the Holy Spirit as you interact with group members. Take anyone who is willing to help. People are busy; no one will want to sign up for this duty. So take anyone who might say yes. Don’t worry about their spiritual lives. Wait until you get potential co-leaders who meet all your expectations. This is an important job. These people may someday be leaders of new groups, so be cultivate extremely high standards. If no one meets your leadership expectations, don’t do anything. Just keep leading alone. A Better Idea … Watch for potential, not perfection. Look for servants, not saints. Look for humble hearts, not superior skills or incredible intelligence. Recruit people like you. Things will go much more smoothly if your core team members will lead with exactly the same style as you. After all, you are the leadership model. They should have the same gifts as you and will make decisions the same way as you. A Better Idea … Do just the opposite. God will likely lead you to people who do not lead like you. Because of that, you may not even see them as “leaders.” Set aside your expectations and trust God to do what only he can do. He is looking for Christlike, not you-like leaders. Look for people who have the most obvious leadership skills, people who have the spiritual gift of leadership, and people who are successful in business. A Better Idea … Consider the condition of their hearts. God will lead you to men or women after his own heart. By the way, leadership is not the only spiritual gift God can use to help lead a group. In fact, those with the gifts of mercy or shepherding or evangelism or other gifts might be the better matches with the gifts you have. Remember, it’s God’s job to put the body together, just as he wants it to be. Look outside your group. It’s unlikely that a suitable core team member is in your small circle. So look around your church for people with superior leadership abilities. Maybe an elder or deacon. Perhaps a businessman who isn’t connected yet. A Better Idea … Look around you. Perhaps God has already put your core team members close to you. They may be the women or men in the group with whom you already have close relationships or those whose gifts complement yours. Just do it all. It’s probably easier for you to keep leading alone. What real difference can it make? A Better Idea … Begin now to share ownership of the group with everyone. Let everyone be involved in the group process. This will help you lead into sharing leadership. (Read my post on the difference between sharing ownership and sharing leadership.) People hesitate to be on a team when the leader does too much. As the group’s leader you must grow in your ability to allow others to use their gifts. Leading alone leads to frustration and burnout for the leader and does not effectively help people in your group grow. Focus exclusively on caring for your group members. You are the group’s shepherd. It’s all about the people in your group right now. Don’t be concerned about anything outside of or beyond that. A Better Idea … and this is VITAL … Remember that sharing leadership is part of the discipleship process. It was part of how Jesus discipled and developed Peter, James, and John in his group. Sharing leadership is also a vital ingredient in multiplying leadership, reproducing groups, and expanding the kingdom of God. It’s a necessary part of our great commission to go and make disciples of all nations. Leaders who hog leadership keep God’s kingdom from growing. Don’t do that! 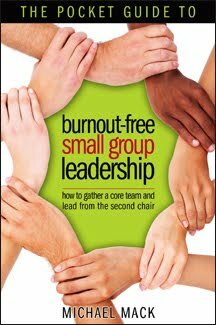 See more about how to develop a core team and share leadership in my book, The Pocket Guide to Burnout-Free Small Group Leadership. Previous article What Should Happen with a Leader Who Has No Time for God?